Charlie Carter watches his shot into the net. 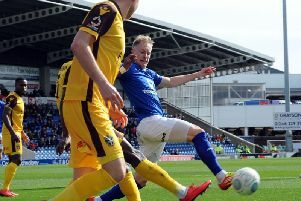 Here is the best of the action from Chesterfield’s 3-0 win over Aldershot Town on Tuesday night. Click on the slideshow above to view the pictures captured by photographer Anne Shelley.